The lanterns arrived for small table centerpieces for our wedding. They're so cute and will fit perfectly in our rustic theme! Only downfall was one of the 10 lanterns arrived with broken glass. I think it they could have been packaged better, but we ordered extra just in case this happened. called about the broken lantern, I was told that a replacement would be sent and it arrived very quickly. Was really impressed with how well it was packed! These mini lanterns are perfect. Very well made. Just what I wanted. Using the lanterns as name cards. Will tie names on the handle so people know where to sit. So cute -- adds the perfect touch! Bought small stands for some so some were sitting and some were hanging! These are great!!! Really nice!! Bought these for centerpieces for my wedding. Definitely fit the vintage theme well. Nicely made but much smaller than I expected. I also wish the handle would stay propped up. These little lanterns looked absolutely amazing in our centerpieces. We used one large lantern with five of these little ones around it. They lit up the reception and we got so many compliments!! Great deal better quality then we expected. Smaller than expected but glad I bought! I bought these for my wedding in July being held in a tobacco barn. THe original use was going to be part of the centerpieces and decorations on the long tables. They will still look adorable around the barn but I will have to find something of more substance for the centerpieces. I read the measurements and knew they werent going to be huge but it actually shocked me HOW small they are. But they are good quality, look great, PRICED GREAT and will add to the wedding decor just fine! I would buy again and again. Trust me you wont find them cheaper ANYWHERE! I looked over and over. Great buy!!! We are going to use these for a fall wedding in a lovely, rustic place. Perfect to add some colored decor too. Perfect favor for country wedding. 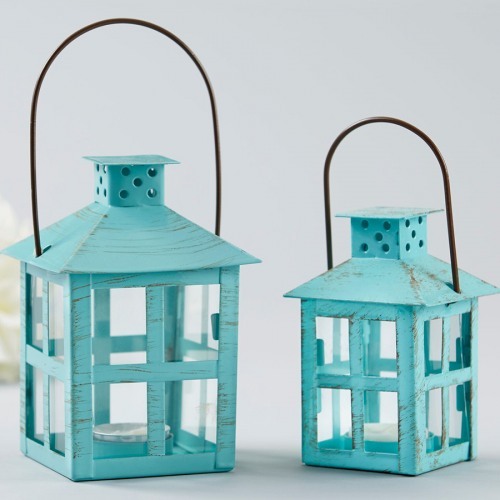 I had these as favors for my daughters wedding and had Large Lantern for middle of table. Works perfectly together. We used these lanterns as Birthday gifts for our Church teenagers. It matched our theme for the year, so they are to remind the girls to "shine forth" to others. Acutal size of lanterns is 2 1/2 by 5 1/2. The lanterns are worth the price. My husband and I are renewing our vows on our 25th anniversary with a large party and I wanted to make it romantic and memorable! I think these little lanterns will help set the perfect mood! My mini lanterns [...] are very cute, looks quality than i thought, looks more expensive than i thought.Will use it as centerpieces with branches and give aways after that so double purpose..Thank you beaucoup. I was so excited to finally find this item. I was searching for mini lanters in Black and all I kept finding was white ones. You saved my vision of what I wanted my tables to look like on my Wedding Day!!! Thank You! These lanterns are just the right size to use as table decorations for my upcoming wedding. With favor tags, they double as cute favors for the guests. The tea lamps were a perfect party favor gift for our guests at a Bridal Shower. Our theme is a winery wedding and lanterns will highlight the idle the bride will be walking. The lamps were unique and a perfect size for our guests to carry home. We bought these to put on the tables at the reception. Very pleased with the quality of the lantern. Q:Is there glass in the lanterns? A:Yes, this item has windows made of glass. A:Simply slip any tea light inside and set atop a tabletop or hang from a treetop. Mini lantern candle favors measure approximately 7" high (including handle) x 3" wide. Tea light not included. Lantern comes assembled. Quaint and romantic, these lantern tea light holders won't just illuminate your reception—they'll set hearts aglow! Each lantern is crafted from metal and glass. Simply slip a tea light inside and set atop a tabletop or hang from a treetop. Lantern candle favors measure approximately 7" high (including handle) x 3" wide. Tea light not included. Candlelight is a simple way to evoke romance at any wedding or anniversary celebration. These candleholders are among our favorites: mini white tea light holders, boutique black tea light holder and glass leaf tea light holders.